NYT COLUMNIST UNDER FRIENDLY FIRE FOR OUTRAGEOUS REPORTING FROM GAZA…….. – The Tundra Tabloids……. 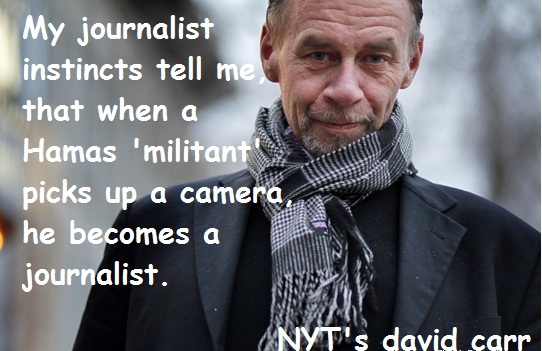 NYT COLUMNIST UNDER FRIENDLY FIRE FOR OUTRAGEOUS REPORTING FROM GAZA…….. If Carr would have been stupid enough to be seated with such a high value target terrorist, he would have gone up in smoke as well, and would have himself to blame. It’s the exact same if US journalists covering the fighting during WWII, would have decided to embed themselves within the ranks of the Germans, and then cry foul when Allied forces bombed the hell out of German soldiers filming the area. I’ll go even further, the only people that are free from being targeted, are those within the medical profession, and that’s as long as they’re not being used by the military for some military advantage other than saving lives. Palestinians have used Red Crescent ambulances to ferry uninjured terrorists from one place to another to avoid Israeli fire. The spray-painted car carrying terror operatives that was targeted by the IDF. Photo: IDF. A New York Times columnist, who covers media and culture, has come under fire for falsely suggesting in a recent column that Israel deliberately targets journalists that it doesn’t agree with. The IDF however asserts that they were targeting a high level terror operative in the strike. An IDF spokesperson confirmed to The Algemeiner that Muhammed Shamalah who was in the car, was a ”commander of Hamas forces in the Southern strip and head of the Hamas militant training programs.” This “places him as a pivotal figure in force buildup and the execution of operations in the area,” Eytan Buchman, another IDF spokesman confirmed in an email. They spray painted the letters TV on his car in a cynical effort to “exploit the cover of journalism,” Buchman wrote. Previous Post Previous Post ISRAELI AMBASSADOR TO THE US MICHAEL OREN: HAMAS HAS A STRATEGY, USE THE GULLIBLE MEDIA TO DELEGITIMIZE THE JEWISH STATE……..
Next Post Next Post FIFA PLANS TO REBUILD HAMAS MISSILE LAUNCH PAD SITE……. An enemies propogandists are legitimate military targets. For instance, according to US military legal guidlines they are to be considered “enemy beligerants”. And we know what all armies do to enemy beligerants. They can call themselves journalists all they like but if their purpose is to create and disseminate military propoganda for one side in a military conflict then they are rightly considered to be enemy propogandists – and thus enemy beligerants. It doesn’t give me a warm cuddly feeling but thems the facts.